Just leave a comment on Susan’s post here. Three names will be drawn on Friday, May 9th. 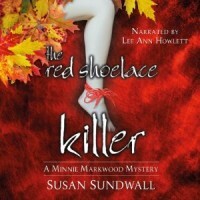 So head over to Susan’s blog and just say ‘Hi’ and you could find yourself following the intrepid Minnie Markwood as she searches for The Red Shoelace Killer. Posted by lahowlett on May 3, 2014 in Uncategorized and tagged audiobook, contest, cozy mystery, giveaway, Lee Ann Howlett, mystery, Susan Sundwall, The Red Shoelace Killer.